The Normal Rotary Club provides coats for Unit 5 students in need. Learn more about Coats for Kids and find out how you can help! Normal Rotary Club members tutor students and provide other support at Unit 5’s Oakdale Elementary School. We’ve also created packs of books that the kids can take home over summer vacation so they can keep working on their reading skills while they’re not in school. We raise funds and buy books for literacy organizations in our community, including The Baby Fold. We clean two miles of the Yuton Highway four times a year. 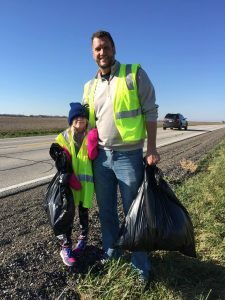 These outings are a fun way to spend time with fellow Rotarians, protect our environment and keep our community beautiful.